2018 Elddis Crusader Aurora - Luxury, 4 berth, single axle with island bed. 2018 Compass Capiro 574 - 4 berth, single axle with fixed single beds. 2014 Elddis Crusader Super Sirocco - Luxury 4 berth twin axle fixed bed caravan. 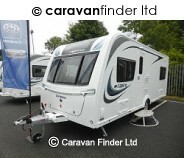 2011 Buccaneer Clipper- 4 berth luxury caravan, twin axle with fixed single beds & end washroom. 2010 Bailey Pageant Provence - 5 berth family caravan with a double dinette. 2008 Swift Oakmere - 4 berth, single axle caravan with a fixed double bed. 2007 Sprite Major 5 - 5 berth family caravan with a double dinette. This would make a perfect starter caravan.